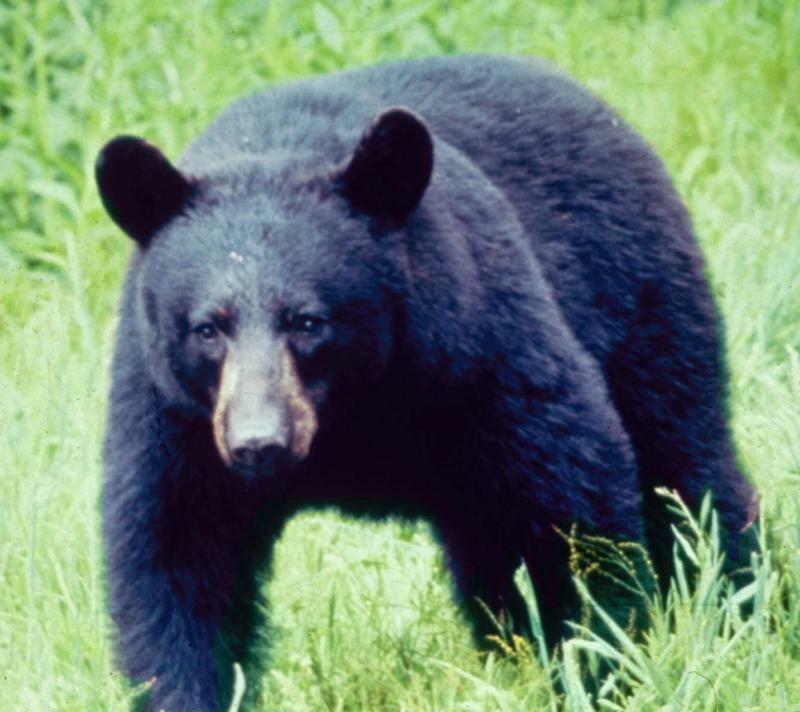 Great Smoky Mountains National Park is home to over 1,500 black bears in the wild. With ten million human visitors each year, the park pulls off a remarkable feat keeping the wildlife wild, and the humans tame – so we guests in the park don’t damage the animals, their well being or their habitat. Everyone loves to see a bear, but the rules of the park demonstrate why cameras have zoom lenses. Federal law requires us to keep a distance of 50 yards from bear and also elk, which are equally dangerous to humans. Feeding bears or other wild animals will shorten their lives. If you ruin their wildness and show that humans are a source of food, eventually park rangers will have to euthanize them for the public safety. Don’t feed the animals! As well as installing bear-proof dumpsters and trash cans everywhere for humans to use, park rangers have developed numerous ways that work in the background to discourage bears away from human gathering places. These practices have greatly reduced the numbers of bears that have had to be killed or taken away. Keeping bears and humans separate is also a safety issue of course. It’s easy for us to forget that these are wild animals – unpredictable, easily aroused, and very dangerous. People get hurt in bear encounters gone wrong. Bears seem slow and easy moving – until humans get too close, especially if those cute little bear cubs are straying too far from mama bear. Then you’ll see how quickly bears can move – they can run up to 30 miles per hour, they swim like champions, and they can climb trees higher and better than we can. Rule Number 1 around all wildlife you see in the park, but especially bears, is to keep a distance. If an animal stops what it’s doing, it’s because you’re too close. Back away gently and increase the distance until the animal goes back to what it was doing. If animals change their behavior, you are the cause. Close contact with humans is detrimental to all wildlife in the park. Don’t approach animals and don’t let them approach you. Observe some of the basic guidelines of the park. Learn what 50 yards is like in mountain terrain. TIP: it’s half the length of a football field between the end zones. Picture this in your mind as you survey the terrain, and keep this distance away from wildlife. If you’re hiking, consider carrying an approved pepper spray with you in case of an accidental encounter with a bear. And check the “Bear Closures” and “Bear Warnings” section of the Temporary Closures page before planning a hike in the park. This is a good reference page for all visitors before they take a trip to any section of the park. Almost always, gradually increasing the distance between you and an animal such as a bear will result in peace all around. But if a bear starts coming closer to you, it’s important to know what to do. In the extreme, you may find yourself fighting for survival! For all these reasons it’s worth studying the park’s website page on Black Bears, especially the safety tips. The chances are good for spotting black bears in Great Smoky Mountains National Park. 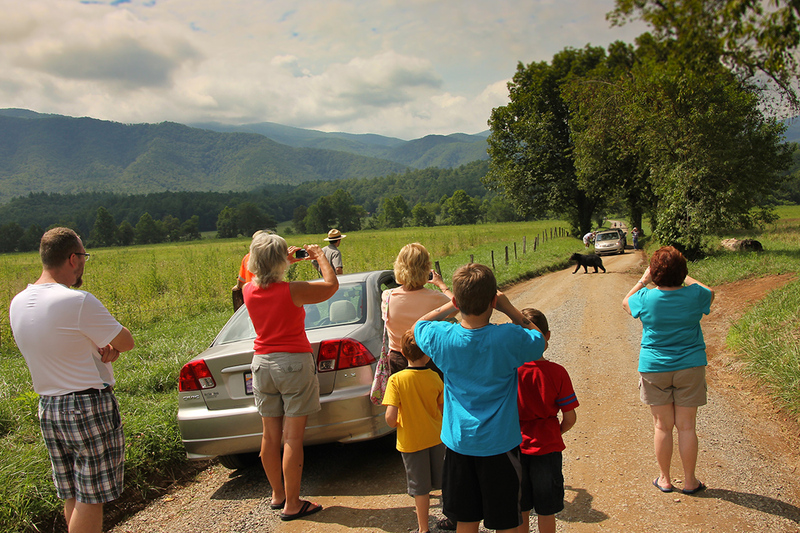 Cades Cove is one of the best places in the park to see bears, and all wildlife. But keep in mind always, don’t move in for that great photo – give it up, or be like the local photographers and have a good zoom on your camera, and view from a distance. Here’s a great 6-minute video about how to treat bears in the Smokies – especially how to know when you’re too close, and what to do next. It’s worth saving as a reference. Thanks to Great Smoky Mountains Association.